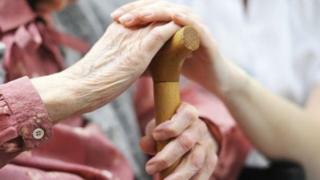 One of Scotland's biggest providers of elderly care is to close all 12 of its residential care homes. Edinburgh-based Bield said the move would affect 167 residents in seven local authority areas. The company, which has been working in elderly care for more than 45 years, said financial pressures meant it had to change the way it operated. However, it said it would continue to provide high quality housing and services for older people in Scotland. The 12 care homes are in Edinburgh, Glasgow, Fife, Falkirk, Scottish Borders, South Lanarkshire and West Lothian. Eunice Brown, whose mother lives in a Bield care home in Linlithgow, West Lothian, said she was "absolutely devastated" at the news. "My mum has been a resident there for five years and it is her home," she said. "Bield has a slogan which says 'Bield is a home for life', so this is a huge insult. "My mum has dementia and I know for a fact that any move she makes will be detrimental to her mental wellbeing." She described the move as "morally wrong". Lynne Boyd's 88-year-old mother, who suffers from dementia, has been resident at Bield Care Home in Uphall, West Lothian, for seven months. She said: "My husband and I felt relieved that she was finally settled in such lovely surroundings with fantastic carers, as the past few years have been difficult for both her and the wider family. "She was unable to look after herself properly at home and had suffered a few falls, the last of which resulted in her spending six weeks in hospital, before being transferred to an interim care facility in Livingston for five months whilst waiting for a 'permanent' care home place to become available. "People with dementia do not react well to changes in their surroundings and the last thing she needs is to be re-housed. "I have visited most of our other local care/nursing homes and there is only one I have seen which comes close but not up to the standard provided by Bield." She added: "My mother-in-law spent around two years in a nursing home in Livingston until she died in June last year, which fell well below the standard of care most of us would expect our relatives to receive. "I am devastated at the prospect of my poor mother having to endure the same fate." Dr Brian Sanderson's mother-in-law has been a resident of Gillie Court care home in Dunfermline for eight years. He said: "She is in disbelief at this and we, as a family, do not know what the future holds for her. "Quite frankly we, and others, feel this is an outrage. "Bield are leaving this to the local authorities and social work department to sort out and when we contact them, the workers on the ground know nothing about this and have received no direction from their seniors yet." He added: "Meanwhile my mother-in-law and others, whilst having to cope with their ongoing illness have to await their fate for their future which is uncertain at this time. "No-one in the latter years of their life should have to deal with that." Brian Logan, chief executive of Bield, said there were ongoing talks with other providers that could mean a small number of homes would remain open. He said: "We are aware of the serious impact these changes will make to people who use our services, their families and our staff. "Those impacted by the changes have been advised and in the coming weeks and months we will be holding consultation meetings to communicate the reasons for the decision and discuss what options are available to those affected - with the aim of minimising the impact as far as possible. "Our five-year vision is bold and we aim to transform our organisation by 2022." John Gallacher, Unison Scottish organiser, said: "First minister, Nicola Sturgeon must intervene and ask how Bield Housing's management team got themselves into this position. "This is a disaster for families across Scotland and it questions the role of government, integrated joint boards, NHS and local authorities. "The task of making alternative arrangements will fall back on public authorities, the tax payer and individual families at a few months notice. "This is at a time when demand for care services can only increase. As a charity, using public funds, Bield Housing must be held accountable." A spokesman for the local authority body Cosla said: "This decision has been taken by the provider because of the long term unsustainable nature of the business model. "Local partnerships are considering how to ensure continuity of high quality care for residents in the different localities affected. "Cosla has also called a meeting of the National Contingency Planning Group, which includes providers, Scottish government, Care Inspectorate, IJBs and local government, to consider any collective or national assurance and action that might be needed to manage the consequences of this decision - not least in respect of residents, their families and the workforce affected." A Care Inspectorate spokesman said: "We are aware this may be a difficult and distressing time for people who live in these care homes, and their loved ones. "We are liaising closely with Bield, care providers and local authorities to ensure that continuity of care is provided to vulnerable people, and to ensure people are supported in any transition to new care arrangements. "Everyone has the right to safe, good-quality compassionate care which meets their needs and respects their rights. "Anyone with a concern can contact the Care Inspectorate."